Publisher: Evolved Games. Developer: GRIN. Producing a gaming adaptation of the hugely underwhelming fourth Terminator film Salvation was likely a thankless task for Swedish developer GRIN. Whilst by industry standards, the gap between its announcement in 2007 and release in 2009 left a surprisingly generous window of development time, you wouldn’t know it from the final product, which is short-lived and as lacklustre as the film that shares its name. Whilst not unplayable, this third-person shoot ‘em up chugs along in a solidly mediocre second gear for large periods, whilst being hampered intermittently by A.I. troubles, a lack of variety, and it’s real Achilles heel, the fleeting nature of the campaign and complete absence of content to busy yourself with thereafter. Wisely, it detaches itself from the film’s morose narrative, instead forming a side-story in which John Connor (granted neither the voice nor the likeness of Christian Bale) attempts to track a distress call from one David Weston, a human survivor pinned down and under attack from the machines. Along the way, Connor gains assistance from tough-lady Blair and weapons-expert Barnes, both ably voiced by their cinematic performers Moon Bloodgood and Common, as well as Angie (Rose McGowan) whose appearance is specific to the game. 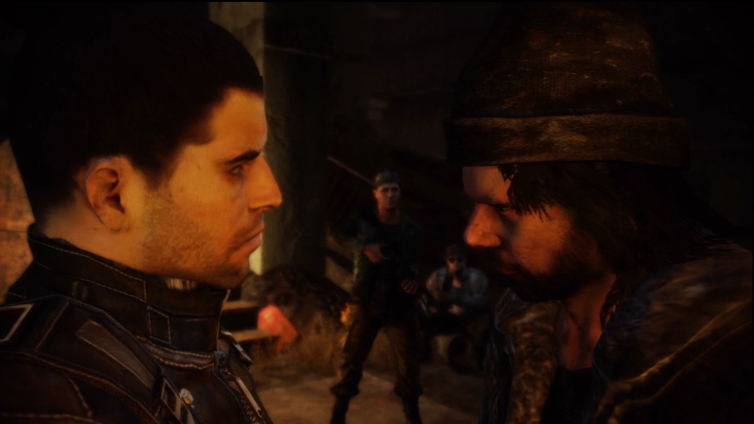 That Connor always has allies with him is no coincidence; the game is built around a cooperative mindset. The machine foes are characteristically tough and require that the player constantly switch their position within cover in an attempt to flank them. It’s an imaginative touch, and many of the battlegrounds themselves offer more scope for utilising this facet of the game than is sometimes first apparent. The player can plot routes around pillars, smashed cars and other debris, or even take to higher ground via the odd conveniently placed staircase. But whilst the locations are good, the battles themselves aren’t, namely because Salvation doesn’t get the shoot ‘em up basics right. The combat lacks panache and variety, and the machines simply aren’t fun or satisfying to fight. There’s just four types of enemy in the game; two are the Arnie-prototype cyborgs with gatling guns (one with skin, one without), then there’s the small flying contraptions known as ‘aerostats’, and finally ‘spiders’, mechs that are only vulnerable from the back. The aerostats offer little challenge but prove awkward as the game deals only a glancing blow to them if shot anywhere remotely off-centre. Cyborgs are more of a headache as they wander right into your covering position at times, ripping you to pieces. The spiders certainly make for the most interesting proposition because of how you’re encouraged to be proactive in forming pincer attacks, though the manner in which they fire constantly at your covering position can become a little trying after a bit. Seemingly at random, the machine A.I. will switch from devious to dozy, an unfortunate trait mimicked by your allies; sometimes they’re on the money, whilst others lead to exasperation as they don’t take advantage of opportunities you’ve crafted. The decaying remnants of an ravaged urban society partway through the process of being reclaimed by nature make for evocative settings that show good attention to detail. The general visual quality is nothing to write home about however, with tacky futuristic presentation, clunky movement animation (particularly the cyborgs), a hazy look to some of the backgrounds and some rather humdrum special effects means it doesn’t trouble Uncharted in the visual stakes. Pretty soon the gameplay becomes derivative, and devoid of imaginative ways in which to move things forward. 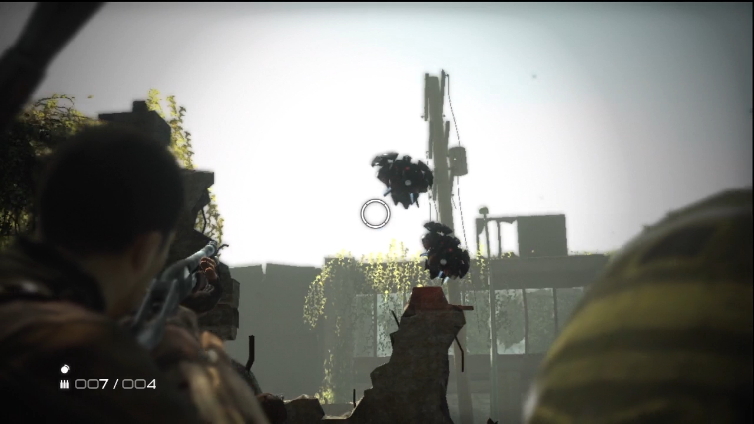 Move to a new area, get ambushed by aerostats from above and while you’re fighting them, spiders will turn up. Rinse and repeat. Aside from a few surprisingly decent on-rails shooting bits, the gameplay never gravitates from this structure right up to its forgettable finale. Aiming and trigger-response controls are a bit lax too which doesn’t help matters. 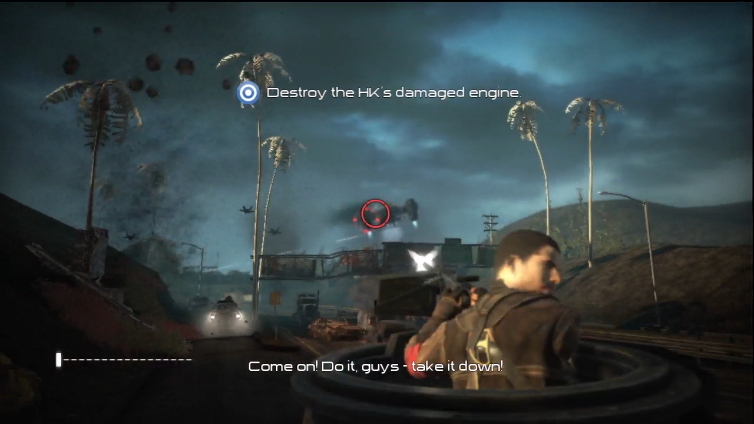 Terminator Salvation’s most troublesome facet however is that it offers very little value for money, and leaves the player with the sense that, as with many film-to-game crossovers, corners were cut. There are only 12 trophies to unlock, all of them attained by completing story levels or the game itself on higher difficulty settings. There’s no hidden content, collectibles or secrets to find within the levels, there’s no competitive or cooperative online play (though there is at least a local co-op option) but most damningly of all, the main game can be polished off in three to four hours first time. The nine chapters appear to offer a bit of meat in the early stages, but from about chapter six onwards they all race by, leading to a low-key finale with little sense of spectacle. It’s a ‘borrow’ not a ‘buy’, and that’s only if you’re a big shoot ‘em up fan or can't live without Terminator. Never terrible but rarely engrossing, most will see everything it has to offer within a couple of days. Much like the film that shares its name, Salvation is conceptually quite interesting, but ultimately doesn’t do anything that hasn’t been done bigger and better elsewhere. "It’s a ‘borrow’ not a ‘buy’, and that’s only if you’re a big shoot ‘em up fan or can't live without Terminator. Never terrible but rarely engrossing, most will see everything it has to offer within a couple of days"